would you like latkes with that? My favourite Jewish holiday starts tomorrow night. I love Chanukah for so many reasons—the nightly ritual of lighting the menorah, the spin-the-dreidel games, the chocolate Chanukah gelt—but especially for the latkes. I like mine with a dollop each of sour cream and applesauce. I admit, I’ve never made latkes. But I make a mean applesauce. Everyone from babies to bubbies adores my applesauce. Leaving the skin on and the pits in, cut apples in half and then again and again until they’re in smallish chunks. Put chunks in a large pot. Add water. Boil over medium heat until the apple chunks are mushy, stirring every now and then, for about 20 minutes. Place a colander over a big bowl or pot and pour the apple mush into the colander to drain, reserving the juice that’s drained. Let apple mush cool down. 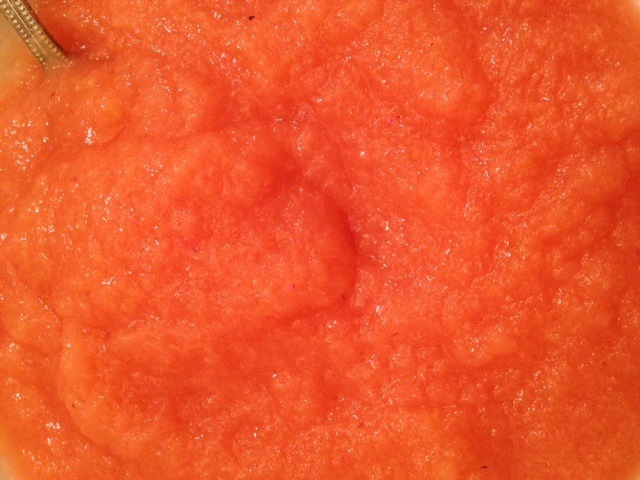 Once cool, put mushy apple pieces into a food mill and purée, scraping down the underside of the mill as you go. Take 2-3 cups of the reserved juice and add it to the puréed applesauce. Place this mixture in a large pot with the lid half on, over medium heat for about 10 minutes, stirring, until you hear little “pop” sounds. That’s how you know it’s ready. Remove applesauce from heat and let cool. Once cool, add cinnamon to taste. 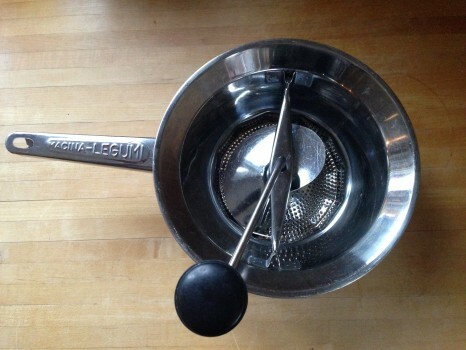 My trusted Macina Legumi food mill. Oven-fried butternut squash latkes – I’m on a butternut squash rampage right now so this recipe called out to me. These babies are baked, not fried in oil, so they’re healthier for you and they won’t stink up the house! I’m going to substitute rice flour for the whole-wheat flour in the recipe. Wish me luck.